Cats at Pound Kitten Rescue, Poole, Bournemouth, Weymouth, Dorset, UK. Please support the Cat Chat 'ADOPT AN OLDIE' campaign by purchasing an Eco-friendly 100% canvas bag. 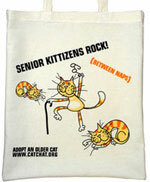 To help highlight the 1,000's of older cats often overlooked in rescue centres, the bags have an exclusive 'mature moggy' design, with the slogan "SENIOR KITTIZENS ROCK! (Between Naps)" available from the CatChat.org Shop. Click on the bag to see more information. 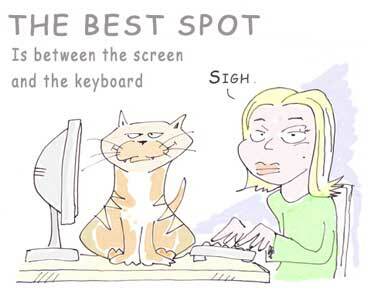 Cats often come from homes where the owner can no longer keep them. Kittens are usually collected from the pound. They are kept in foster homes mainly in the Poole, Bournemouth, Christchurch area until they can be found a new home. All adult cats are neutered, and treated for worms and fleas. All our cats will eat anything (unless otherwise indicated) and are litter trained. If you are fostering a cat for Pound Kitten Rescue please e-mail information about the cat and a photo to the webmaster@poundpuppy.org so that it can be added to the Cats Needing Homes page. HOLD means we are waiting for confirmation that a prospective adopter will take this cat. ZIGGIE - Black and white, neutered male, 3 years approx. Cats are rescued and homed every day so some of the cats on this page may have been homed by the time you read this. Disclaimer: Although every effort is made to ascertain these details are accurate, Pound Kitten Rescue and its staff cannot be held responsible for any problems arising from the information displayed here. Looking for a Dog? Click here!  Cats Requiring Homes at the National Animal Welfare Trust in Berkshire, Watford and Somerset. Dedicated to the rescue, rehoming and care of Persians and other pedigree cat breeds, UK wide.